The DashPac will display boost pressure in PSI and air fuel ratio right on your factory dash. Works on all 2009 and newer MoTec iControl skis. This is an all in one package which is completely potted and waterproof. Once the unit is connected to the LTC port you will be able to display air fuel ratio and boost on the factory dash. You toggle between the AFR and boost settings using the skis factory up and down arrows. This model requires installation of a sensor into your exhaust manifold and a MoTec LTC. This is the Latest Version and offers On ski Configuration that allows it to work on any Bosch Ski to date. If you Provide your skis Year and model we will pre-configure it before shipping to make installation easier. 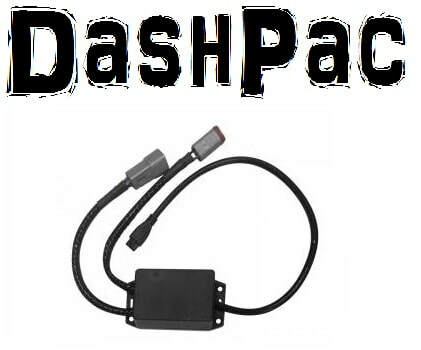 If your Ski has a Seadoo depth finder then the DashPac Depth Module is also Required. 2012-2018 Sea-Doo icontrol skis only. Important fine print. We are not associated in any way with MoTec.